As the turning point of the European theater in WWII, the Battle of Stalingrad has spawned numerous movies across multiple countries. 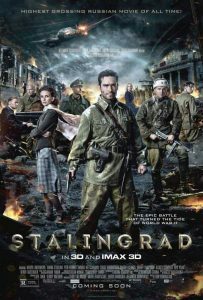 The latest of these is the 2013 Russian film Stalingrad, the third film on record with that name (the other two are a 1993 German production and a 1990 joint Soviet-East German-Czechoslovak-American production). Directed by Fedor Bondarchuk, who also made the acclaimed 2005 Soviet Afghan War film The Ninth Company, this 2013 Stalingrad is a slick, modern production shot in IMAX format and featuring ample special effects. The movie opens with a rather puzzling framing narrative: a Russian rescuer during the 2011 Japan Tohoku Earthquake decides to calm a group of trapped German students by telling them about his “five fathers” who fought at Stalingrad (never mind the fact that someone conceived around that period would be nearing 70 years old and likely not doing dangerous earthquake rescue work). We’re then transported to 1942, where we meet these “five fathers”: Polyakov, ironically nicknamed “Angel”; Chvanov, whose family was methodically murdered by the Germans; Nikiforov, a former singer who now rarely speaks; Lieutenant Sergey Astakov, a junior artillery officer; and Captain Gromov, the group’s leader. While converging on a strategic building in Stalingrad, the five soldiers encounter reach other and a 19 year old girl named Katya, who refuses to leave the building and is its lone surviving resident. Unsurprisingly, the men grow fond and protective of her. Meanwhile, on the opposite side is Captain Peter Kahn, a decorated but disillusioned German Wehrmacht officer. Wallowing in self-pity, he finds himself a Russian mistress named Masha, further complicating his already muddled emotions. When a new superior officer arrives and orders Khan’s unit to attack the strategic building our Soviet “five fathers” have dug into, Kahn is thrown back into the fray as the main antagonist, opposite Captain Gromov. What ensues is a bloody, action-packed film, though not as gory as it could’ve been (it’s far more tame than the beach landing scene of Saving Private Ryan) given how brutal the Battle of Stalingrad was in real life. We’re treated to a vast variety of scenery and weaponry — everything from sweeping views of the Volga River troop crossing to Heinkel bombers crash-landing. The footage is crisp, the color grading appropriately dark, the fires vibrant and ferocious. Though not horribly original in structure and concept, Stalingrad‘s character development and emotional resonance are praiseworthy. For such a large array of characters, the film manages to tell just enough backstory to make us sympathetic, but not enough to waste time or detract from the action. While not replete with philosophy, Stalingrad also manages to provide an appreciable amount of moral food for thought (villainous Germans displaying a human side, protagonist Russians doing not-so-savory things out of rage or revenge) on both sides of the battle. If you’re looking for a different perspective on the Allied side of World War II, Stalingrad is worth your time. Though not a smashingly fantastic hall-of-famer, it’s as well-constructed and entertaining as any decent Western war film, with the added benefit of helping you expand your horizons on WWII. Stalingrad (Russian: Сталинград) — Dialog in Russian. Directed by Fedor Bondarchuk. First released September 2013. Running time 2hr 11 min. Starring Petr Fedorov, Yanina Studilina, Dmitriy Lysenkov, Aleksey Barabash, Andrey Smolyakov, and Maria Smolnikova.